Our protaganists fire upon the invading Green Fire army until they run out of ammunition – and then they try to fight the horde off with handheld weapons. The Shovelor and Star Shark are overcome by the masses of Green Fire – and to their horror they discover that the creatures are sapping them of their energy, causing them to grow weak and lose consciousness. The Flaming Carrot discovers that the Green Fire dissolve when hit by water, so the remaining heroes grab what they can to douse the fiery beasties. Bondoman uses the airplane’s fuel pump to rig up a firehose and lets ’em have it – wiping out the remaining Green Fire creatures. Fortunately the Shovelor and Star Shark are saved. The Green Fire leave behind piles of green glop after they’re been hit by the water, and Professor Daub determines that they’re some gigantic form of germ or virus. The group splits in two, The Spleen, Bondoman and Mystic Hand will repair the fuel pump while the rest go to check on the blimp that the Turtles used to get to the site. The group finds the dirigible unharmed, and they also uncover Polaroids from the doomed research mission. The scientists had apparently befriended and fed the Green Fire – until they ran out of food, and were forced to fight for their lives. Professor Daub uses a radio and discovers that the static pulse that caused so much trouble for the Mystery Men’s plane is now growing stronger, The archaeologist surmises at the rate the pulse is growing, it will cover the entire planet in about one week – causing untold of harm. Colonel Blade takes charge to end the menace. Back at the landing strip, the Spleen spots something in the jungle, but is too frightened to check out what it is. Mystic Hand leves to investigate while Bondoman continues repairs on the plane’s fuel pump. The rest of the team is now searching the ruins of Botaquaxal. Zeke’s wonders if the structures are tombs, but Mike relates his dream of the place, where it was full of life and the buildings had doors and windows. Most of the group scoffs at Mikey’s dream, but the Turtle knows he’s right. Professor Daub locates the source of the static and they begin to look for an entrance. Meanwhile, Leo, Screwball and Don discover a Green Fire asleep on one of the cots inside the researcher’s camp. To their shock, as they approach it it stands up and speaks English! Daub has opened some secret doors in the building and the team gears up to investigate the interior. Inside they find monstrous skeletons – one having a gold filling. Back at camp, the talking Green Fire explains that it was once a human soldier accompying the scientists on this research project. He tells of how the team had befriended the Green Fire, and how they ate everything save for plants – and once the supply of animals and insects had run out, the Green Fire attacked their human companions. Soon enough the men ran out of ammunition and were eaten – and to the soldier’s surprise, his mind became one with his killer and he now was trapped in the body of a Green Fire. He’s sure the same has happened to the rest of his team, but he doesn’t know where they are or if they survived the attack from the previous night’s event. Don asks if the Green Fire were once the people who lived in the city, but the creature only remembers the soldier’s life. Inside the structure, the guys find a huge pile of Green Fire eggs. Daub is excited as it’s an opportunity to take a Green Fire creature back to the USA – and he’s convinced that Botaquaxal was not built by creatures from Earth. Back at the plane, three ghostly apparitions appear. Screwball and the Turtles decide to take their Green Fire companion to see Professor Daub. 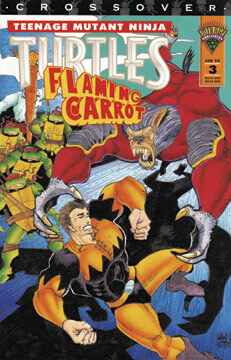 Continued in TMNT/Flaming Carrot Crossover #4.